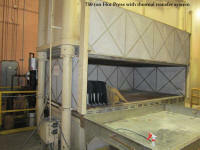 Tech Machinery Inc offers to purchase your used industrial plant equipment. 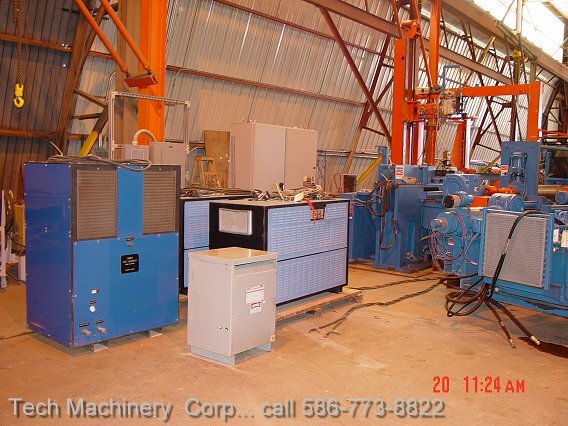 Tech Machinery Sales Inc. has for over 20 years purchased all types of used industrial plant production equipment. 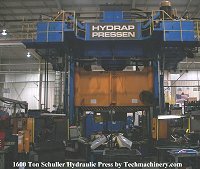 We specialize in purchasing high quality, late model industrial machinery designed for automotive industry production plants and the metal, or plastics fabrication shops. If your looking to sell used hydraulic or mechanical punch presses, CNC machining centers, robotic welding systems, milling machines, plastic compression molding systems, to complete plant production lines we are ready to serve you as a full service buyer... or sales agent. We also broker used plant equipment and offer a variety of services from specific machinery searches to physical inspections, electrical control updates and rigging. Our MBA members can also assist you with shipping worldwide. TM wants your surplus equipment. We are always looking for surplus equipment to purchase. 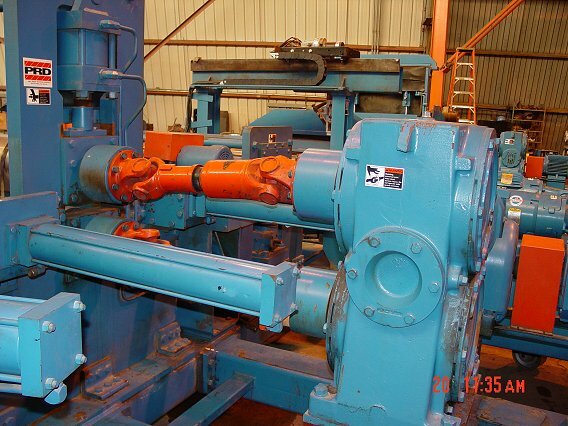 Click here to E-Mail us descriptions of your surplus used plant production equipment you will to sell and our experienced buyers will contact you for details and arrange inspection and purchase price offer! 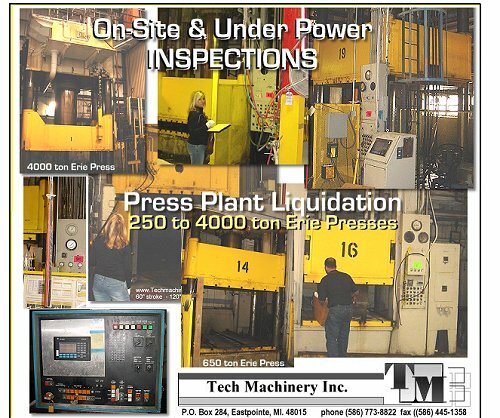 Call and talk to a Tech Machinery buyer... (586) 773-8822. 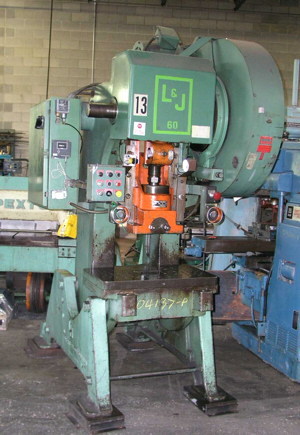 Thinking About SELLING YOUR Used Industrial machinery? 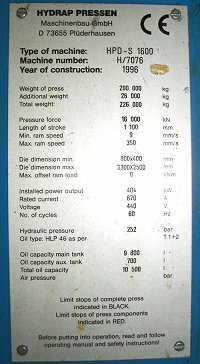 Get it listed here at TechMachinery.com. Sample listing currently for sale is shown below! 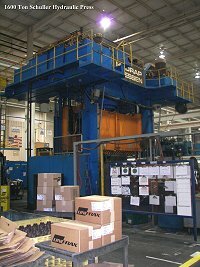 We specialize in heavy duty hydraulic and mechanical metal stamping presses from top manufacturers like Erie -Siempelkamp -Bliss - Verson - Williams and White and KR Wilson Presses. 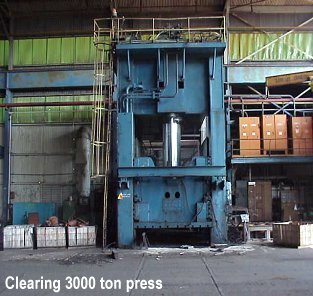 Used industrial bending and shearing machines, Upenders, and forming presses compliment our sourcing service for stamping presses. 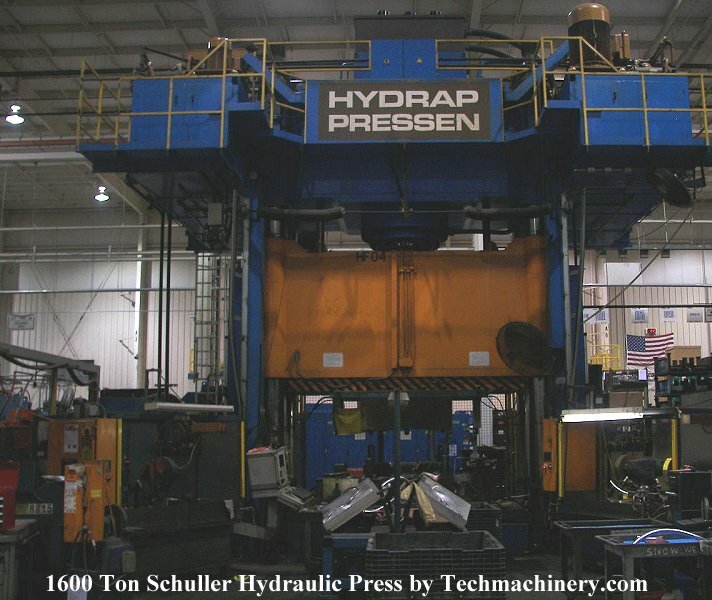 Tech Machinery also offers complete hydraulic and mechanical press refurbishing, repair and relocation services for buyers of our used presses and plant production machinery. 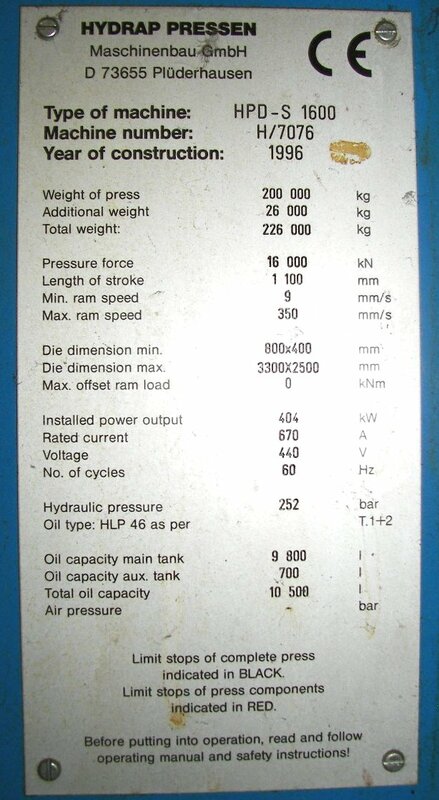 Ram speed return from 0 to 20 IPM and Platen size 72" x 144"
Oil Temperature 600 degree F and has water circulation system with cooling tower..
600 GPM @ 43.3 PSI with 20 HP drive motor. Platen and Bolster level via linear control. 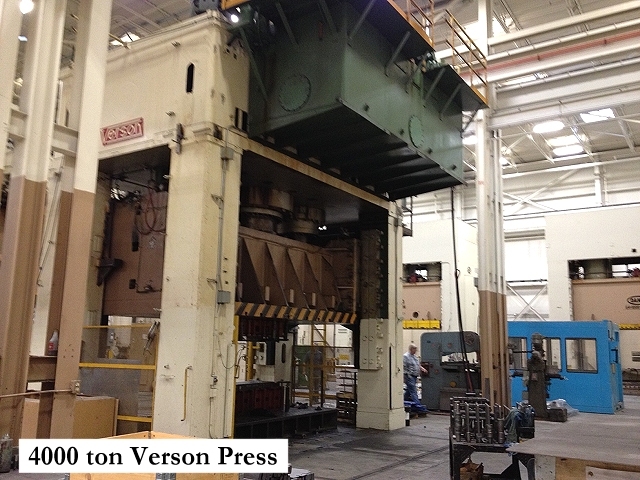 Press has 2 fabricated steel platens, one attached to crown and other to the up-acting bolster. each platen has 72 heater elements and labyrinth of passages for even heating and cooling during operation. Ceramic insulators and 4 heat shields with front capable of manual raising and lowering for die setting. 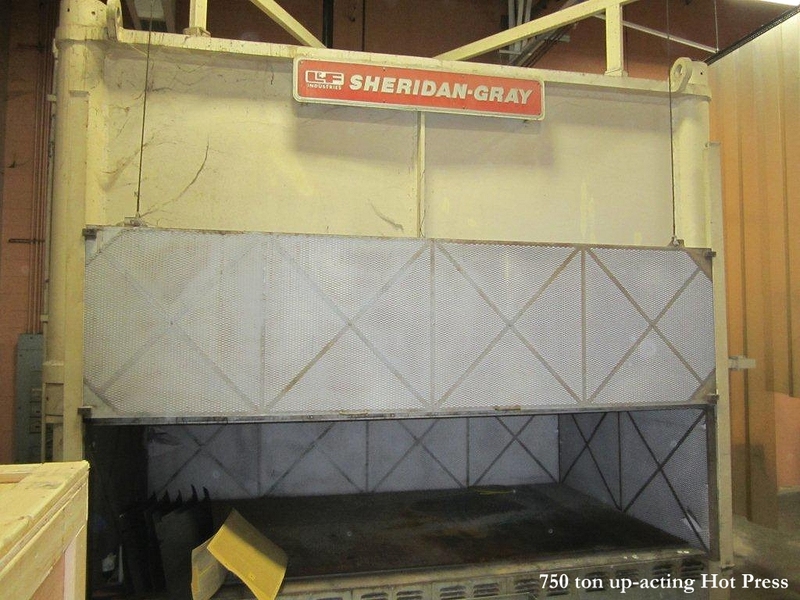 Call Tech Machinery Sales for price on this 750 ton Sheridan/Gray molding press system. 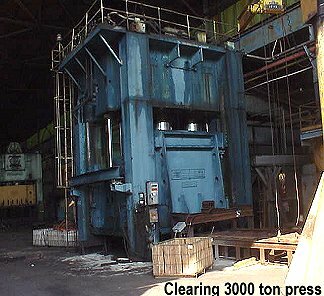 Grabil Indiana Compression Molding plant liquidation sale on ERIE, French Oil, Hepburne and Williams & White major brand presses ranging from 400 to 4450 ton capacities. We also have some HPM and Toyo Plastar brand injection molding presses for immediate sale in this Grabil In. Plant Liquidation sale. Understand the production capabilities and condition of the equipment your selling and make sure it meets the needs of your customer. Hidden expenses will come back to haunt you if you don't give full disclosure at time of sale. Make sure you provide the buyer with verifiable maintenance records, equipment retrofit information, manuals and complete manufacturer specs. Allow purchaser to verify the condition of the equipment through an on-site inspection or use a expert third party opinion or appraisal on the condition, value and all acquisition related to a total acquisition cost. Paramount act as a expert " buyer agent" for many prospective clients. Research the competitive pricing and provide full descriptions and photos whenever you post Ads for used machinery. Check the buyers credentials, history and references to make sure the sales gets completed. If it sounds too good to be true - it probably is! Disclose the costs for relocation, retrofitting, and "buyers" auction fees". Consider using third party expertise and brokerage services when selling used plant or construction equipment. Post your equipment listings here where buyers trust the integrity of the sellers and seek total fulfillment services. All our brokers receive the RFQs generated through this site to reach a wider base of potential buyers! CNC controlled Brake and 10' x1/2" LVD Hydraulic Shear also available. TechMachinery Inc. offers fee based services ranging from expert appraisels, auctioneering and plant liquidation sales, retrofitting, transporting and onsite rigging through our industry alliance members. Machine Brokers Alliance (MBA) members will have access to a "business to business" private web site for streamlining transactions and communications between resellers- brokers- manufacturers- and industry specialists.